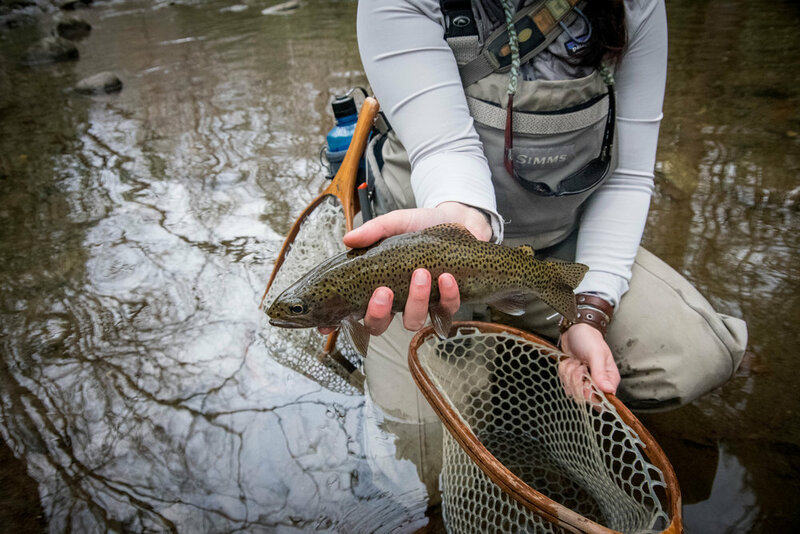 I have so many great memories in my short five years spent fly fishing; each one is special and unique in its way, places and fish that I day dream about daily. Sure, I've haven't fished in any "exotic" locations. I've never caught any record breaking fish. Hell, I've never even fished in anything but a mountain river, but that doesn't matter. Recently I had one of those memorable days; I met one of those unforgettable fish. 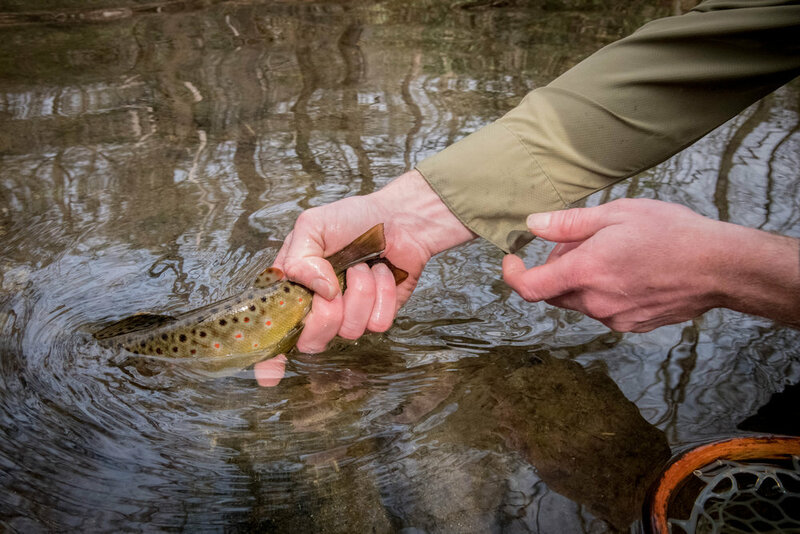 I've often made jokes about my love of Brown trout, how the other species of trout don't count, how bored I get in the winter with the influx of rainbows. They're truly just jokes, but brown trout do hold a special place in my heart. I'm even slightly infamous in these here mountains for my "brown trout dance." It's silly, I know, but I just can't help myself. Jacob and I found ourselves right in the middle of an explosive hatch on the Davidson. The "D" is a river that you're not supposed to be able to fish drys, let alone get a fish to take it. It's Midge water, 14-foot leaders, 6, 7, sometimes even 8 and 9x tippet. Crazy-picky fish. 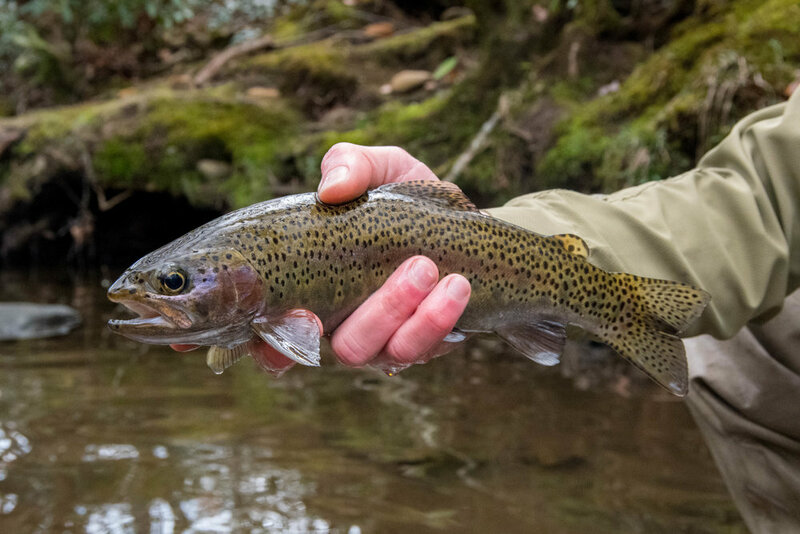 After an hour of fishing in the "acceptable" fashion and landing an average number of pretty good fish, Jacob and I decided to take a chance and see if we could coax a few of these trout into eating a dry. A quick fly exchange (still size 26), a healthy dosage of frogs fanny and we were in business. First cast, up one came, following closely but never taking it, this was hopeful. A few casts later, BAM! Gotcha! 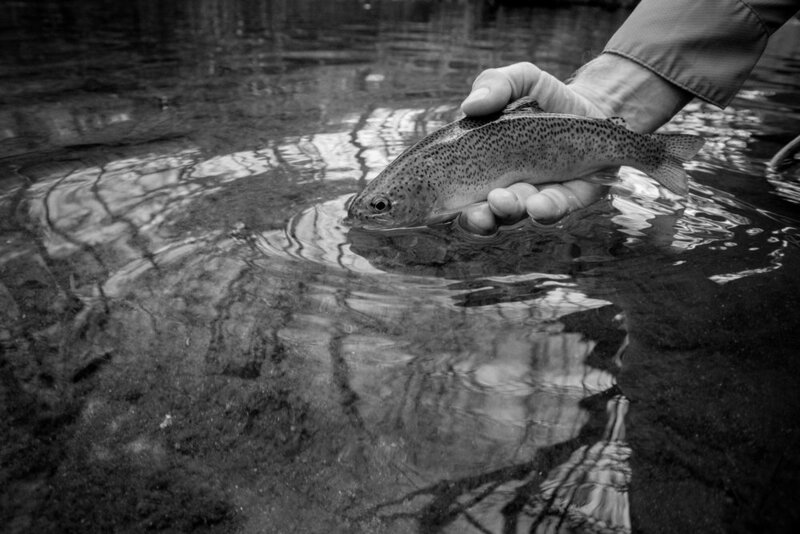 The day continued like this, healthy browns and rainbows, rising to the fly, eating and making it to the net. The whole day we had both had our eye on this one brown. He kept chasing other smaller fish that we hooked, stirring the common fish out of his way, taunting us for hours. 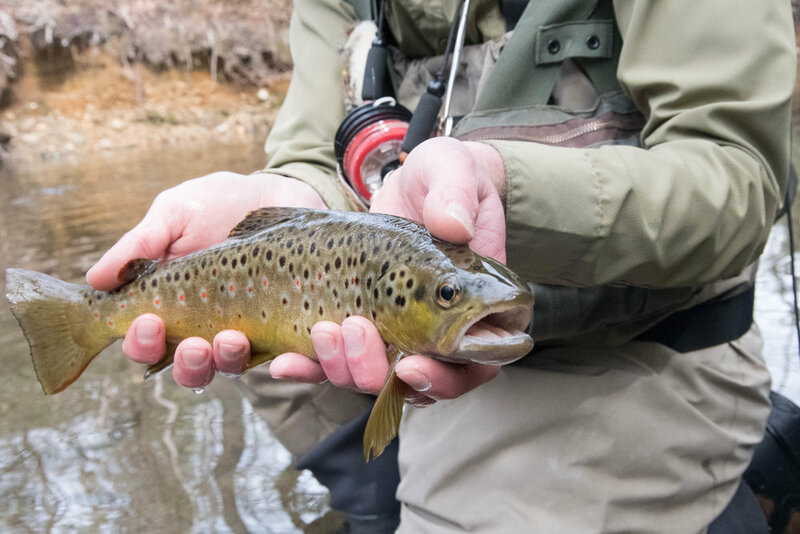 We'd cast to him, and he'd just move aside, not abnormal behavior for a trout this size in this body of water. I'm convinced that the larger browns also have much larger brains, causing them to outsmart us regularly. Eventually, we got over this guy, deeming him as uncatchable and a straight up tease and no one likes a tease. "GET OUT OF THE WAY!!!!" I heard those words echo across the river. "Is that him?" I asked Jacob, and sure enough, it was. I grabbed the camera and waiting for the fight to end and this guy to end up in the net. But, he didn't end up in the net, he ended up breaking off the tiny fly and swimming away. The only thought that entered our minds was, Oh well, that's why we come back, right? The day was far from over; the fish were still feeding, the bugs were still hatching, the sun was still shining. Then it happened, I saw my fly slowly being slurped under the water. Hook, set. It was him, again. I'd observed what happened before, I saw how strong he was, and I was going to land this brute. Downstream we all went, trout, me and Jacob following close behind with the net. We went down and around, up and back down. It was more like fighting with a giant log that kept floating around than a trout until he spits up what was slowing him down. Up came a 10-inch rainbow, tail first, along with a few mushed up bugs. That's when this guy came to life. Jumping, throwing his head, swimming around rocks, trying every trick in the trout playbook to get off, but eventually, I got him. He wasn't a large fish, definitely didn't set any records, people catch fish of this size fairly regularly on the Davidson, but it was the first time I'd landed one this big. When we decided to call it a day Jacob asked if I thought it had been a 30. It's an odd terminology we use to describe the day. It may be about the number of fish landed or the size of a fish. Quirky, yes, but we know what it means. It was definitely a 30 day.